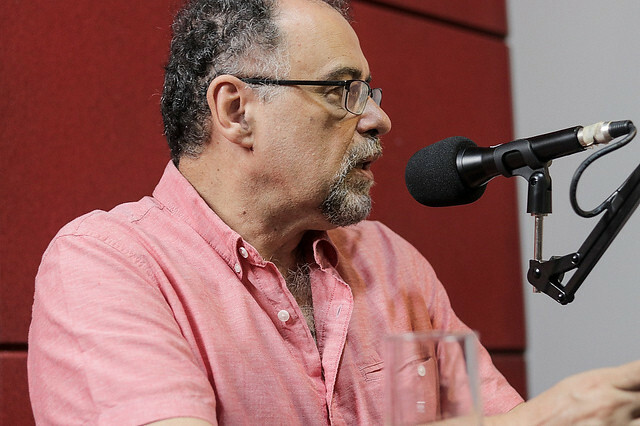 Last Thursday’s No Jardim da Política show on Brasil de Fato Radio welcomed political science expert and foreign affairs professor Igor Fuser to our studio in São Paulo to talk about one of the most controversial topics of 2019 yet: Brazil’s Jair Bolsonaro foreign policy. Reporters Nina Fideles and Leonardo Fernandes conducted the interview with Fuser, who pointed out Brazil’s alignment with the United States and the weakening of regional integration processes in Latin America. Fuser also spoke about the rise of the far-right in Brazil and the world, as well as what to expect for the Latin American scenario in the near future. Read the highlights of the interview below. Brasil de Fato: On what is the Bolsonaro administration’s foreign policy based? Igor Fuser: It’s very important to understand what constitutes the reckless babling, the real nonsense, the sheer amount of hogwash this new foreign minister [Ernesto Araújo] says, which is a really harrowing, embarrassing thing. In diplomatic circles, what we hear is that people are ashamed and shocked at how low the level of the discourse of the command of Brazil’s diplomacy is. But we have to tell the torrent of nonsense apart from what is substantial in foreign policy. Its main aspect is Brazil’s complete, absolute, unconditional alignment with the United States. Brazil takes up a subordinate position that has never existed in its diplomatic history. Not even in the military regime, or the Fernando Henrique Cardoso [FHC, 1995-2002] or [Fernando] Collor [1990-1992] times Brazil has been as submissive [as it is now]. The history of Brazil’s foreign policy is marked by a pursuit of some kind of autonomy. A broader, more complete, more assertive autonomy, such as what we had during the office of [foreign minister] Celso Amorim, during the [Luiz Inácio] Lula [da Silva] administration [2003-2010], or a more timid, more negotiated autonomy, such as in the FHC administration. Now Brazil is at the feet of the United States, like a soldier at Uncle Sam’s service, aligned with the worst of the US, which is [Donald] Trump’s diplomacy. There are some limits to it. While Bolsonaro’s stance regarding Mercosur is pretty much aligned with US interests, we do have a huge trade flow with Mercosur. If we brushed this initiative aside, as well as other international agreements the country is part of, that would hurt the country’s economy. What is your take on these limits of the ‘pre-announcements’ made by the Jair Bolsonaro administration? There are domestic factors that, as you pointed out, impose limits to the implementation of this policy that is subordinate to the United States. There are commercial interests. For example, the US government’s priority right now is the face-off with China. The world today is marked by the geopolitical dispute, and the US effort to fight China’s economic presence and influence in Latin America. The foreign pressure the Brazilian government faces – that was very clear in the Temer administration – was to try to push Brazil away from China. However, it is Brazil’s major trading partner, the major buyer of our export commodities. Especially soybeans; secondarily, iron ore and other products. So imposing limits to Brazil’s trade with China would result in a real collapse of strategic industries in the Brazilian economy. These are very complex boundaries. You mentioned Mercosur. Brazil will not cease it, because the Brazilian bourgeoisie benefits from Mercosur, as well as transnational corporations operating in Brazil and Argentina. So what they will do is limit Mercosur’s reach, reinforcing this trend of abandoning any regional integration project. And Brazil is not alone. The administration in Argentina is going down the same path. The same goes for the Middle East matter, the conversations to move Brazil’s embassy to Jerusalem. Only two countries in the world have made this decision, the United States and Guatemala. It’s a statement that shows a rupture with Brazil’s history of political neutrality in the Israeli-Palestinian conflict. That means that, if they go through with it, we risk losing [Brazilian] exports to Muslim-majority countries. It’s an attempt to please evangelical groups that have a completely insane view of things. They mix up the Old Testament Hebrews and some Bible passages with the current status of the conflict between Israel and Palestine. That did not come from Brazilian evangelicals. It comes from the US, where evangelical fundamentalists share the same views and exert pressure in that sense. The alignment you mention is also ideological. It’s yet another contradiction of this government. While its slogan is “Brazil above everything and God above all,” it [this alignment with the US] impacts our sovereignty – our pre-salt oil reserves, the Amazon, the concerns about climate change, which is also closely related to the Amazon. Can we say these are the United States’ major interests regarding our sovereignty and our natural assets? Those who claim to be patriots are the biggest traitors of our country, and that has to be stated very clearly. “Brazil above everything” is not above everything so much – it’s beneath the US. It’s completely hypocritical. Regarding our natural assets, we are witnessing crimes that have never happened in Brazil’s history on such a large scale. Handing over our pre-salt oil, for example. Pre-salt oil is the biggest treasure of the global oil industry of the last 60 years. They are gigantic high-quality oil reserves. Petrobras developed technologies that allow low-cost, high-efficiency exploration of pre-salt oil, and that oil is being handed to transnational companies on a platter. One third of our pre-salt oil has been already given to foreign companies at vile prices. And the rest of it is going down the same road. The plans by the [Luiz Inácio] Lula [da Silva] and Dilma [Rousseff] administrations to use the pre-salt as a factor for Brazil’s development were completely abandoned. We are living the biggest denationalization process of the Brazilian economy in our history. We are going back to the condition of colony. In the geopolitical landscape, we’re witnessing far-right governments consolidating their power. Brazil is a major actor in the Americas, and that means something, but there is also resistance. Several elections will be held in 2019, [Nicolás] Maduro was inaugurated in Venezuela. What can we expect for this landscape? Looking into the global scenario, there is not a lot of reason for joy. We have a world that is not strengthening democracy, social justice, human rights – on the contrary. The rise of the Right builds up from the very failure of capitalism in meeting the expectations of the masses, of peoples around the world. People are very frustrated, outraged, and that outrage, politically, tends to be channeled to something. The Right has been able to channel it better than the Left. The Right points to the enemy. In Europe, the enemy is the immigrant, the foreigner, who becomes a scapegoat. They are managing to sell all over Europe the idea that they would be much better off if it weren’t for Africans, Latin Americans, Asians, and so on. In Latin America, they are finding the Left as the enemy, selling a distorted idea and favoring rabble-rousing projects, such as the one that won the elections in Brazil. Around the world, that outrage is channeled to religious fundamentalism, like in the Middle East. Even in Latin America, if we look into what the rise of evangelicals means, it has a lot to do with the denial of the world. It’s also capitalizing that dissatisfaction. You don’t see perspectives in the world as it is, so you embrace the perspective of a future life after death, which is offered by religion. In Latin America, we had a period when social struggles advanced a lot, progressive governments came to power in many parts of South America, Central America, and the Caribbean too. Those governments were successful in many aspects. They implemented public policies to improve education, health, wages, consuming power, and food and reduce poverty. Progress in a number of areas, but that was not accompanied by a change – that would be necessary – in terms of values and ideas. The ideas remained bourgeois, capitalist, and it’s really hard to make this ideological change. It’s not something you get by simply snapping your fingers with a strategic decision. There are complex factors to it. So failing to change what [Marxist philosopher Antonio] Gramsci called “common sense,” these mindsets in the realm of ideology, favored the counterattack of conservative forces, which explored the weaknesses of these governments. Now comes the counteroffensive – a very strong one – from the Right, and it’s paying off. They took over the government in Argentina and Brazil and are trying, by all means, to take over the government of Venezuela. This year, we will face new battles. They will try to take over the government in Bolivia, and it won’t be a simple battle there. Bolivia is the South American country with the highest growth rates over the past 15 years. In the Evo Morales administration, the country made significant social advances. The minimum wage, for example, increased fourfold in ten years of Morales administration. The Bolivian government has many favorable elements to offer to democratically face the Right on the ballot – and, behind it, the local bourgeoisie, imperialism – and try and turn the situation around there. That will happen later this year, in October. Uruguay will also hold elections this year, and Cuba will hold a constitutional referendum. Will they be forms of progressive resistance against the rise of the Right in Latin America? The Cuban government is taking significant steps to strengthen its legitimacy and improve democracy and the possibility of people’s participation in a very difficult context. This offensive by the Right in Latin America is reflected in Cuba. There were expectations that the international insertion of Cuba would be normalized after an agreement with the US during the Barack Obama administration, but that was overturned under Trump, who is pushing a harsher, more aggressive policy. Cuba is standing up for themselves and strengthening the legitimacy of their revolution, protecting their advances and the socialist spaces that have been established. Cuba has been resisting for 60 years and will continue to resist.